Let the dragon become you. Genji is reformed—at peace. Though his body was destroyed in a confrontation with Hanzo, his older brother, the Overwatch team put him back together. He lives now as a cyborg: Genji is a living weapon with enhanced speed, agility, and strength. It wasn’t until he met omnic monk, and Overwatch hero, Zenyatta that he accepted his uniqueness as a gift. Free from what held him back before, Genji is stronger than ever. Overwatch’s cyborg ninja is one of the most challenging heroes to learn, so a little bit of inner peace could help burgeoning Genji mains, too. Mastering the shuriken and sword will turn any player into a serious threat. Here are some tips and strategies for playing Genji like a ninja. Cyber-Agility is a core piece of Genji’s kit. As a passive, it’s always on. He can climb walls and double jump on command. Reaching areas that other heroes can’t, Genji has mobility that sets him apart from other DPS characters. 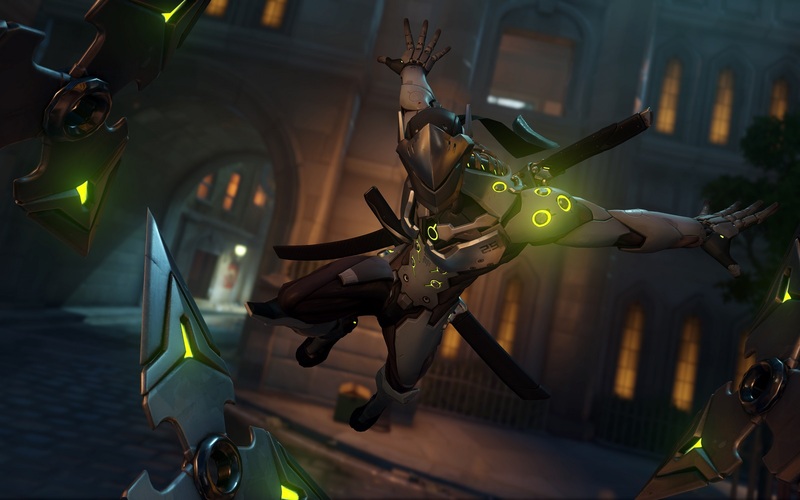 Speed allows Genji to dance in and out of battle—he’s hard to hit when moving—to gain a positioning advantage. Get creative with approaches using Genji. Catch your enemies by surprise by flanking from a weird angle, and dashing away before you can get caught. Wall-climbing and double-jumping can also be used to peek over ledges and throw shurikens, ducking away before any damage is taken. It’s a good way to gain some intel on the enemy team, as well as to charge your ultimate a bit. Genji should always have an escape route in mind, however, even if you’re just poking. You don’t want to get caught off guard and taken out before a fight even begins. A major damage dealer for a team, Genji is essential in team fights. Jump and dodge behind enemy lines to take out pesky healers while your team takes on the front line. Double-jumping while attacking (you’ve got to really practice your aim while moving) makes Genji hard to hit, too. 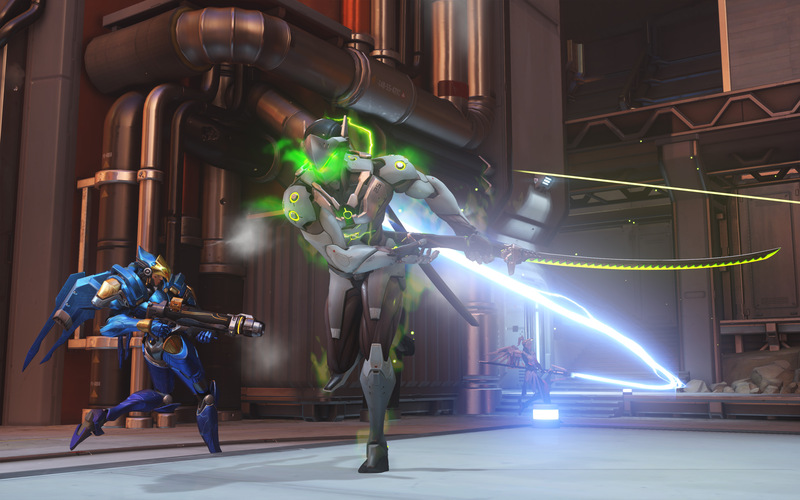 Genji has three different damage dealers: Shuriken (right click), Fan of Blades (left click), and his sword. You’ll do most of your damage with Genji using his shurikens. The primary fire sends out three shurikens, one straight after the other. Each projectile does 28 damage. Fan of Blades does the same damage, but the shurikens have a wider spread. The right click is typically more accurate at long range, while Fan of Blades is nice to have when up in an enemy’s face. The sword is used in three ways—with Deflect, Swift Strike, and Dragon Blade. Deflect, as you might imagine, deflects enemy shots and sends them back at the opposite team. He can only Deflect from the front, so be wary of enemies coming from behind. Timing is crucial when using Genji’s Deflect. Say an enemy McCree is about to Flash Bang Genji and take him out. That Flash Bang can be deflected back at McCree and will actually stun him, allowing you to land a key headshot and make an important pick. Swift Strike (left shift) is another sword move. Another way to be highly mobile with Genji, Swift Strike also does 50 damage to any enemy that it connects with while dashing 14 meters forward. Be smart with Swift Strike: Use it in situations where you’ll be powerful and mobile. It’s got a eight second cool down, but the cooldown resets with an enemy kill. If you can get in and make the kill, you’ll be able to Swift Strike out and do damage to others as you leave. 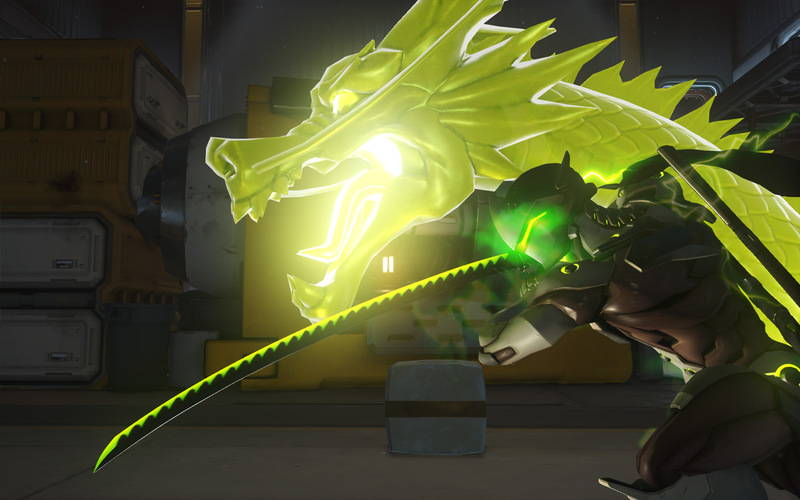 Dragon Blade, Genji’s ultimate, is a game changer—and the last way to use Genji’s sword. 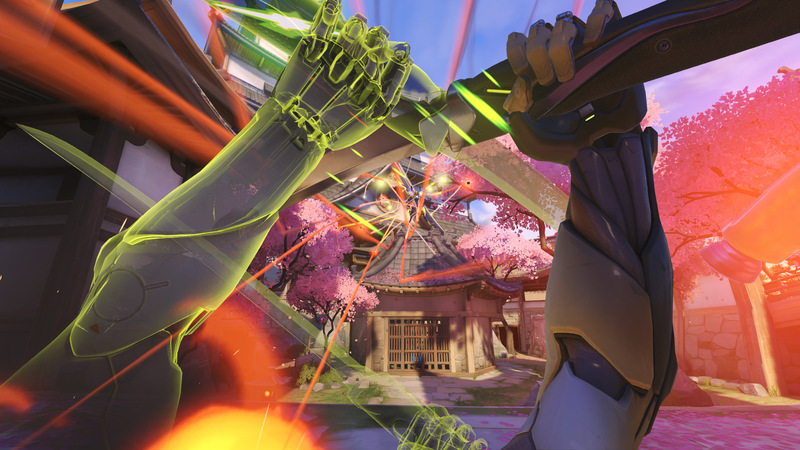 Swinging his sword wildly, Genji does 120 damage with each hit, moving eight meters with each swing. He can easily take out squishy heroes in quick succession, but he loses his ability to do ranged damage. It’s best to use Dragon Blade while in a close quarters team fight. Remember to use Deflect and Swift Strike while Dragon Blade is active to get the most out of the ultimate. Ignore the tank heroes and focus your efforts on low health heroes, like DPS or healers. Though Ana was once popular with Genji because of her Nano Boost ability, the ultimate’s nerfs made the combination less popular. Still, it’s a good pairing, though. Genji does more damage and can survive longer, even if he is no longer faster. Ana is also one of the healer who can keep Genji topped off with health while he’s diving into the enemy backline. Likewise, Zenyatta can keep his healing orb on Genji to keep him alive while he’s diving into the enemy territory. A healer like Lucio is less effective in this regard. Zenyatta can also make killing enemies easier by targeting heroes with his Discord orb. Genji can reach all the places that Widowmaker likes to set up shop, which makes him a good counter to the sniper. A deflect from a Widowmaker shot can also make quick work of her. Genji can’t deflect Winston or Zarya’s beam damage, which makes him especially susceptible to getting hurt by them. Zarya’s bubbles also make it very annoying to do damage to her and those she’s protecting. Pharah can easily get away from Genji with her jetpacks, and because she’s in the air, Genji has no way of reaching her. Genji isn’t the easiest hero to learn. He’s got a pretty high skill-cap. A good Genji, however, can change games. Practice him with intention, and you’ll get better in no time.